Nowadays, with gear being truly reasonable, there is an incentive to invest in gear and accessories outright. 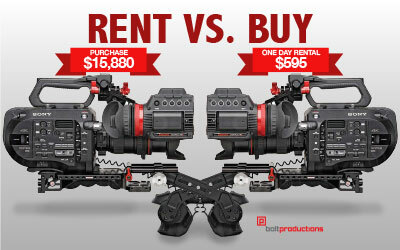 However, there are unseen costs that come with both renting or purchasing professional video gear. If want to work with cinema primes or need a steady rig for a heavier camera, then consider the pro and cons of Renting Video Equipment vs Buying. There is much less cost up-front with renting. You don’t have to deal with one large lump sum to buy what you need. Renting a video camera is also 100% tax-deductible as an operational expense under the 179 IRS Tax Code. When it comes to the type of equipment you get, renting is flexible and offers more possibilities. You aren’t as restricted by high up-front costs to try something new that may really help your business. With renting, you don’t pay for maintenance. If something breaks or has issues due to normal wear and tear, your local video rental company is in charge of repairing the equipment. Renting takes the risk out of your production. If you have tens of thousands of dollars and know specifically what camera and lenses you will want to shoot all of your projects on for the next 2-3 years then buying may make sense for you. But we know that in reality the needs of various projects call for different cameras, and it’s very hard to predict what format or style is going to be popular 6-months to a year from now. You usually pay higher costs over time than you would buying outright. Take a look at our usage break-even chart to help you determine if renting is an option for you or not. Availability of products may be limited depending on the stock of the renting firm. Your choice of brands or models could potentially be out of stock or not carried at all, so you may have to settle for something else. Some people are concerned when renting equipment as opposed to owning equipment is that they’re never 100% sure what they’re getting when they rent it. Let’s be honest for a moment, how often do you maintain your equipment? Truth be told, professional rental video equipment is likely better cared for than your own gear. Need more advice? Take a look at the helpful links below. If you still aren’t sure what’s the best option for you give Bolt Productions, or a Dallas video camera rental shop near you, a call. *Table reflect retail prices for new camera bodies only, lens cost are not included. Bolt Production video rental prices include: case, media, batteries, and card reader. Rental rates may vary and subject to change. These prices are for illustration purposes only.